R is 27 months old. We had a great week last week. We had a bit of sunshine, and although it was still cold, we managed to get outside almost everyday. R has been recognising letters when we read books. So excitied by that. R did a foot painting. I saved the paper that my deli goods were wrapped in when I last went shopping. The paper is large and quite thick. I just drizzled some paint on the paper and R walked on it. I had to hold his hands so he didnt slip, but he loved it. He did 2 paintings. R printed with our square stacking cups. ﻿He wasn't so keen on this, doing it for a short time only. Many years ago, I made a face where you can velcro the pieces in place. I got it out for R because he loves velcro, and he loved it. He did it so many times, first it was Daddy, then Grandad. Before we did it we looked in the mirror to see where all the parts of our face are located, then R began to stick the parts on. As he did, I talked about where parts are located on the face, and he got everything in place. I am not sure where I got the face from. R did the Square Magnet Page from Home Grown Hearts and the F is for Fish magnet page from Confessions Of A Homeschooler. We tried with marbles, but they kept rolling off the page, so I got out the sparkly pom poms. I got out the felt food that I made a few weeks ago. I made a sandwich with fillings and a pizza with toppings. Both ideas were seen at Serving Pink Lemonade. R had a great time, especially making a sandwich and pretending to eat it! I gave R some feathers to explore. He enjoyed this, and kept trying to tickle me and M with the feathers. I put some flour into a tub for R to explore. 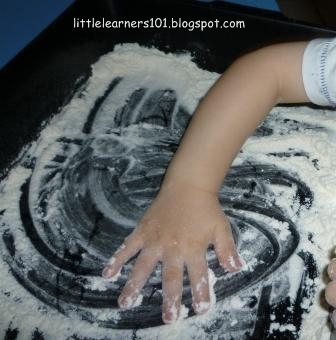 He absolutely loved it and spend over 1/2 a hour playing with the flour. He moved it around, drew in it and sprinkled onto his and my hands. ﻿We used the Main Letter Page from Tot School Printables again as a playdough mat. I also put out the F and fish cookie cutters. We also used the Ff lacing card and puzzle from Tot School Printables. R is getting good at putting the puzzles together, but still only laces the card a few times. I got out our magnetic fishing game to play with R. He did not like this last time I got it out, but this time he loved it. He played with it so much that it is still out on our shelves now. He gets this look of intent concentration on his face when he is trying to 'catch' the fish with the fishing rod. R is still right into drawing and tracing at the moment. I gave him the Ff tracing from Confessions Of A Homeschooler. He is getting so good at this now. R did a finger painting on a letter F.
R stamped with Ff stamps on the foot from ﻿Tot School Printables. He really got into this more so than usual. R did some Ff Sorting from Confessions Of A Homeschooler. R traced a square from the shape tracers that I printed from Home Grown Hearts. We got out our wooden blocks to sort the squares. We also looked at squares and rectangles to see the differences. I showed R the longer sides on the rectangles. I had intended to make squares out of straws with R, but when I went to get out the straws, I discovered that we only had 3 straws left, so I got out the craft sticks instead. I quickly made some little mats to help R with the constuction of the squares. He really like this activity and made the shapes several times. I saw this idea at Shannons Tot School. Once R had made the squares, we counted the sides. R did Do-A-Dot Painting on a square, from Childcareland. He did this quickly, and is getting much more accurate each time he does this. When R was about 18 months old, I made some squares from sandpaper. I got these out and R matched the differet grits of sandpaper. I also got R to trace the edges to feel the shape of the square. R made a little shape man from squares, and of course, had to put some wiggly eyes on it! I cut out the squares and a mouth for R and then he completed the rest on his own. The final product is kinda cute! We sang "Five Speckled Frogs" this week. We kicked a football around when we were outside. I used masking tape to make a square on the floor. R walked around the lines and jumped in and out of the square. We made fairy bread this week. It was simple thing that R could complete on his own with little help from me. He spread the butter on his bread, then sprinkled the 100's and 1000's over. He loved this. I got out our small plastic fruits and coloured bowls for R to do some sorting. R was so excited when he saw these. He loves these sets, we have transport, bears, fruit, farm animals and dinosaurs. I am a Tot School newbie and found some great inspiration from this post. Thanks and keep up the good work momma!